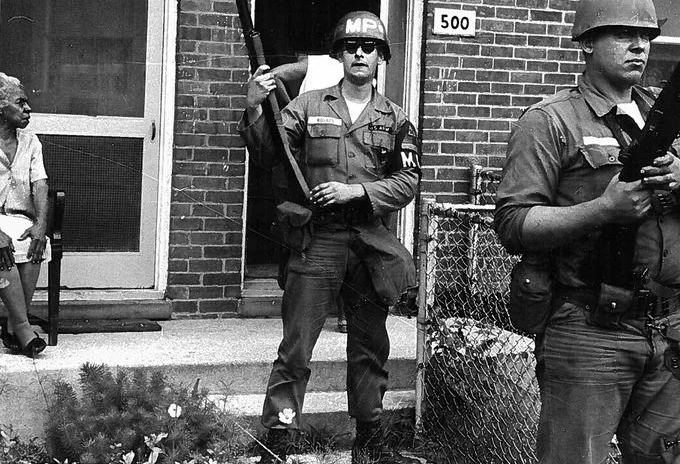 I was sure I’d written here on the 1967 Plainfield, NJ, riots, a.k.a. rebellion or uprising. Apparently not. There are a few FB mentions in my feed and those of others from that place and time. A search will yield many links for that summer’s violence, also in Newark, Cambridge MD and beyond. There’s even a “Kerner Commission” report. 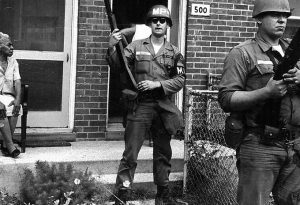 Truth be told, Plainfield was not a city many could have pegged for a race riot. Newark, sure; Low levels of integration and long-time hostility. Plainfield was well integrated (the high school of roughly 2000 students was half black). The races socialized during and after school. The sports teams were real teams and low personal conflict. Maybe the housing concentration should have made the possibility more obvious. Many black families lived between Front Street and Seventh. When the trouble started, it was there, which became know as the riot zone. That’s where the stores that people looted and even burned were. It was where the National Guard went rampaging in surely unconstitutional searched for over 100 stolen semi-automatic rifles stolen nearby. They went into apartments of friends and ripped the rooms apart, terrifying and brutalizing the residents. My family lived in low-rise apartments on the other side of the high school. Had it not been for my mother’s job, I might have been in the majority of local students with no real contact with the riots. As it was though, Wanda Ball, my mother, was the exec at the Plainfield Red Cross Chapter. A small detail is that her offices were inside the riot zone. More to the point, it was her job to help as needed. She also figured out how they could do that. That’s how I met Milt Campbell. 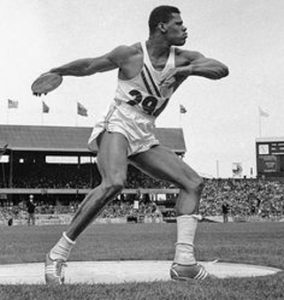 One of the country’s all-time great athletes, Olympic decathlon gold medalist (and national and state champion in numerous sports, including mine, swimming), he had left a racist America to play football in Canada and live in peace with his white wife. He returned to help his hometown when he learned of the trouble. I had graduated a year before. That summer, I worked as a life guard and swimming instructor at a swim club in a tony suburb above Plainfield (Brookhill in Watchung). It was somewhere between Leave It To Beaver and Mad Men with the hausfrau and privilege. I had been a Red Cross volunteer from long before I could object. I built parade floats, stuffed mailings, ran office machinery, taught first aid and swimming and on and on. My mother knew how to harness her two kids. Come the riots, my sister was off in college, but I had most of my day free, minus a shift at the swim club. There was work to be done. She set immediately to getting donations of milk, water, food, diapers and such trucked to the chapter. Inside the policed zone, most stores were closed or looted. Plus the residents were forbidden by Guard and cops to be on the streets. So, the Red Cross station wagons that normally ferried the infirm and elderly became supply vehicles. I started showing up at the club with one of the white wagons and a white bump hat (known to those who don’t know as a hardhat, but they are plastic). The club moms were horrified. The guy who taught their kids lifesaving and swimming left the club and headed into danger each afternoon. Many offered to, really insisted without effect, that I sleep over instead. I had grown up with Wanda heading to fires and other emergencies to offer assistance as needed. This was more of the same to me. I was surprised though to find the famous Milt Campbell standing in the chapter parking lot ready for duty. It turns out that the janitor had been a well-known professional softball player when that was a thing before WWII. So this elderly, slight guy teamed up with the gigantic Campbell, and the two former breaststrokers on the high school team, Joel Blumert and me. It must have been conical to see Milt on the truck moving two or four four-gallon cartons of milk or water from inside a truck to the bed. I would take one or two and move them down to Joel, who in turn would pass one at a time along to the janitor, Cecil, to put into a station wagon. As I recall, with each hand-off, the cartons dipped lower. We filled the wagons though. Then I’d drive while a couple of us delivered the essentials to those who needed them. Milt, Joel and I shared coaching of a great human, Victor Liske. We spoke if his inspiration. In fact, if you’d like a moving tribute, click on Milt’s acceptance speech as NJ athlete of the century. It’s good stuff all the way. The parts about Coach Liske start around 13:20. Back to Plainfield, much to the surprise of the Brookhill families, helping out did not cost me my life. I never even needed the bump hat.